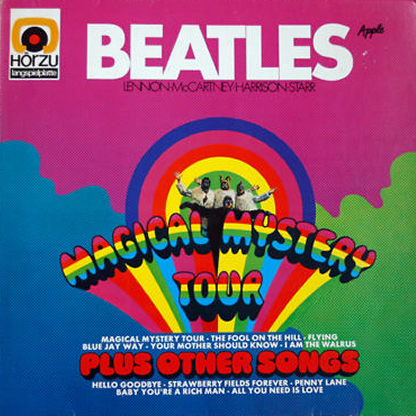 It's the 47th birthday of Magical Mystery Tour ! The most beautiful mistake ever made by Capitol. In going to mention that, I noticed MMT didn't have a thread for itself, so I guess this is for minor nonspecific points and questions or opinions that don't require a separate thread. I personally really love this album. It has one of the best singles ever released and one of the most enjoyable psychedelic songs on it. The whole thing is fun to listen to, if only we could say the same about the movie! I remember being very protective of it at the time……(I'm surprised today is it's birthday as it first aired on Boxing Day). It was in black and white on our tv which didn't help. Today I'm just glad it's there. Interestingly that whilst the US album was out, the British EP wouldnt be for a further 11 days so we'd still be waiting to hear 5 of the tracks. The 'Hello, Goodbye ' single would just have to tide us over. Down to curiosity @Mr. Kite, why do you call this "the most beautiful mistake ever made by Capitol" as it wasn't a mistake. They planned it all out to the point of having to seek permission from the Beatles/EMI to compile and issue it as an album instead of an EP and presumably pass the track listing and artwork. @Wigwam, its the US album not the tv special that mr. kite was talking about. @meanmistermustard I know it was planned out, just like all of the US albums (except the first few they just wanted to get out quickly). They were planned to stretch out the songs and make more money, correct? I was just saying the way they butchered all the albums, instead if releasing them as they were in England, how the Beatles intended them, was a mistake. Therefore, this being the best thing (in my opinion) Capitol put together themselves, I think it was "their most beautiful mistake." But there was no UK 'MMT' album and no EP market in the US, so if anything this is the one Capitol didn't make a mistake over putting together. Issuing what the UK was going to get would have been the mistake, something the Beatles must have understood as they granted unique permission for its release. I'm also not sure "mistake" is the right word for any of the US Beatles albums aside from maybe their 'Revolver '. Its easy looking back and saying Capitol should have just released the UK albums as they came but the US record industry was vastly different then and nobody knew at the beginning the Beatles were going to be huge, there was no way Capitol were going to treat the Beatles differently to any other artist/band and why should they have? The Beatles even cooperated with the policy by recording two exclusive tracks for the US market: 'Dizzy Miss Lizzy ' and 'Bad Boy '; whilst George Martin shipped over a handful of tracks well in advance of the UK release. Loved this version of the album back then (it was widely available in Australia when I started buying albums in around 1970), particularly the crazy book(let) which came with it. I only caught up with the TV movie a year or so ago and it wasn't half as bad as I had expected from all the critical vitriol. @meanmistermustard Ignore anything I said upthread that does not include the word birthday. I understand where you are coming from. Maybe "mistake" was the wrong word. Let's call it "The most beautiful Captiol manifestation ever". This is the (US) album that first turned me on to the Beatles. I will always love it. Thanks for the thread, @Mr. Kite . Good album but worst album cover... imho. When John Lennon was asked if he thought Ringo was one of the best drummers in Rock-and-Roll, he said (smiling) "Hell, he's not even the best drummer in the Beatles." The whole dress-up & mask thing was just a little too weird... even for the psychedelic 60s. True... I posted the EP cover because I prefer it to the LP cover... but it is still poor album art. Don't get me started, TJ! This is what should have been put on the 2009 Apple USB along with the singles (45's), not the Capitol record or Past Masters for that matter. *Though I agree with Mr.Kite, it was a wonderful mistake by Capitol records! SGT PEPPERS LONELY HEARTS CLUB BAND!